Discover the best landscapes in Catalonia that can only be seen through the motorcycle with this tour! 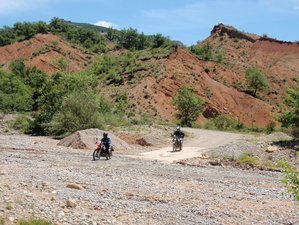 This Motorcycle Enduro Tour TransCatalonia is an offroad crossing with departure and arrival in Barcelona of approximately 800 kilometers. You'll have an adventure through the mountains and roads of Catalonia including the Pyrenees. Although it is a journey without technical difficulty, it is necessary to have a minimum experience in driving offroad. Every night, you will stay in a different hotel or country house for a well-deserved rest after a day enjoying the bike and the landscapes that you will see. If you do not have a motorcycle, you don't have to worry because the tour includes the rental of motorcycle prepared for offroad driving. You will stay in different hotels or rural houses in Barcelona, Baga, Esterri d'Àneu, and Tremp during the trip. The first and the last day's accommodation will be close to Barcelona. In this tour, you will explore the routes throughout Catalonia, Spain. The cities you will visit include Barcelona, Baga, Esterri d'Àneu, and Tremp. Daily breakfast and dinner with typical meals of the zone will be served for you in the tour.